The Encén El Nadal, UIA-HYP Cup 2014 International Student Competition in Architectural Design and d3 Natural Systems 2014 competitions: The bloggers’ pick of this week’s competitions! With the ‘Encén El Nadal’ [Lighting up Christmas] initiative, the Barcelona City Council aims to foster Christmas spirit and share with the entire city the responsibility of achieving unique lighting that is associated with Barcelona’s attributes as an innovative, creative and internationally recognised city in the world of design. This public tender for the design of the 2014 Christmas lighting on the streets of Aragó and Gran Via will also promote both established and emerging professionals from the design and creative-industries sector and help to revitalise the economic activity of shops located in two of the city centre’s main commercial hubs during the Christmas period. The application period for lighting ideas is open from Friday the 6th of June to the 4th of July, and they will be divided into two different sections. Lighting for Carrer Aragó –for the sections between Passeig de Gràcia/Bailén and Aribau/Passeig de Gràcia– is open to students from architecture, engineering, design and plastic-arts schools, as well as graduates in these disciplines who graduated less than two years ago. Lighting for Gran Via is open to any professional persons linked to creative fields, including architects, plastic-arts creators, designers and engineers, who are working in their chosen professions at the time of presenting their applications. 2014 marks the third edition of UIA-HYP Cup International Student Competition in Architectural Design. As the exclusive annual international student competition in Mainland China sponsored by UIA (Union International des Architectes), HYP Cup competition has provided a platform for architectural schools and students from different countries to exchange ideas on current architecture issues in relation to environment, specific sites, and urban spaces. The Unexpected City is a city of wonder, a city where imagination, creativity, and a new urban scheme which intertwines ancient tradition, modernity, and technology. It will offer a new perspective in space of living, nature, and respect for everyone with concrete architectural and urban projects. After all, home is not ‘where the heart is’ but where the house and neighborhood reside. If you have a high level intellectual ambition, artistic originality, and freedom of thought to bear on those who build the world and on those who take this course, then this is your competition! The d3 Natural Systems competition invites architects, designers, engineers, and students to collectively explore the potential of analysing, documenting, and deploying nature-based influences in architecture. The 2014 competition calls for innovative proposals that advance sustainable thought and performance through the study of intrinsic environmental geometries, behaviours, and flows. 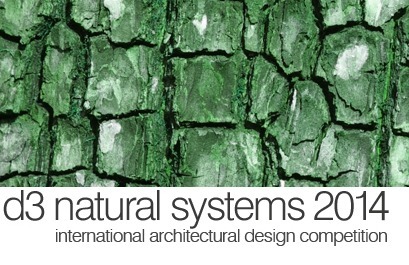 Concurrent with sustainable thought, the d3 Natural Systems competition assumes that architecture does not simply form, but rather perform various functions beyond those conventionally associated with buildings. Design submissions must be environmentally responsible while advancing inventive conceptual solutions. Although proposals should be technologically feasible, they may suggest fantastical architectural visions of a sustainable global future.The d3 Natural Systems competition allows designers freedom to approach their creative process in a scale-appropriate manner–from large-scale master planning endeavours, to individual building concepts, to notions of interior detail. Accordingly, there are no restrictions on site, scale, programme, or building typology, proposals should carefully address their selected context.